Reflective NFPA 704 Placards meet the requirements of the NFPA Protection Specifications. IDM's Placards are warranties 6 Years against color fade due to Ultra- Violet light. 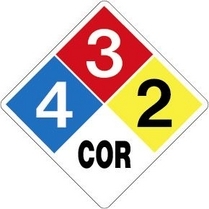 Consult corresponding MSDS on file for every "Hazardous Chemical" in the workplace to direct you need for yo0ur Placard or call you local Fire Department for their assistance. Size............................15 1/2" x 15 1/2"
Magnetic Placard (only) $29.89 ea. Magnetic Reflective Symbols $11.29 ea. Mail your payment along with this "Order Form". Quick Order: Fax Order Form to IDM Signs. IDM will "ship" your order UPS COD.